The Chancellor has risked opening a major rift with Europe after describing Brussels as "the enemy" in the Brexit negotiations. Philip Hammond told Sky News that he understood emotions in the Government were running high, but urged his colleagues to stop squabbling and focus on the Brexit talks. He said: "My message is this: I understand that passions are high and I understand that people have very strong views about this but we're all going to the same place, we all have the same agenda. "The enemy, the opponents are out there, they're on the other side of the negotiating table. Those are the people we have to negotiate with, negotiate hard to get the very best deal for Britain." 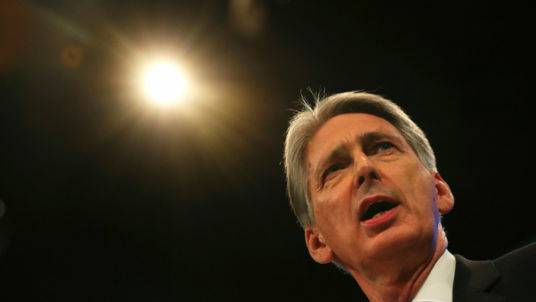 A matter of hours after making the controversial remark, Mr Hammond apologised for his "poor choice of words". "We will work with our friends and partners in the EU on a mutually beneficial Brexit deal," he tweeted, ending his message with #noenemieshere. Downing Street sources spoken to by Sky News have reiterated Prime Minister Theresa May's support of the Chancellor in the wake of what he said. Shadow chancellor John McDonnell said the comment was indicative of an "inept approach from a failing government". "Insulting the EU is not the way to protect our economic interests," Mr McDonnell wrote on Twitter. Peter Dowd, Labour's shadow chief secretary to the Treasury, said Mr Hammond was "acting like Basil Fawlty on holiday". Mr Hammond has been under extreme pressure from Cabinet colleagues in recent weeks, amid frustration that he is holding up the talks and being too pessimistic about Britain's prospects outside the EU. His comments come at a fragile juncture for the Brexit talks, which are still mired in discussions about the size of Britain's divorce bill. Hours before Mr Hammond spoke to Sky News, European Commission President Jean-Claude Juncker said: "I'm not in a revenge mood. I'm not hating the British. "The Europeans have to be grateful for so many things Britain has brought to Europe before war, during war, after war. But now they have to pay."